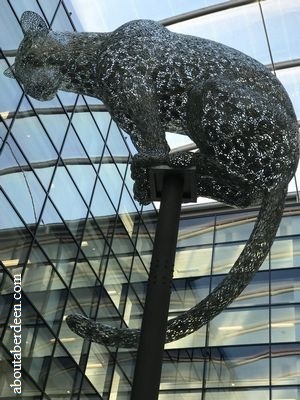 The atrium of the Marischal Square in Aberdeen hosts this beautiful steel sculpture of a Leopard by the Kelpies artist Andy Scott. It was commissioned by Muse Developments and Aviva Investors. The leopard was used because it features two leopards in the Aberdeen City coat of arms. This dates back to when they were gifted to the City by King James I for when the City underwrote his expenses when he was held captive in England. It is 5 metres tall and weighs 2 tonnes. The steel column is 10 metres. Each fragment of steel were individually wielded and it opened to public viewing from the 3 November 2017. The Aberdeen leopard has been named Poised by the artist. 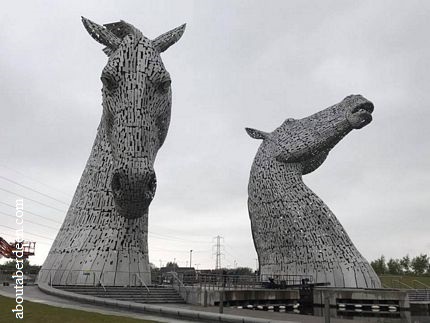 Sculptor Andy Scott also made The Kelpies in Falkirk, Scotland.